Known as Act 10, the public union law limits bargaining rights to issues only involving base wages, bans some government employers from automatically taking union fees from employee paychecks, and requires yearly recertification standards, among other rules. Opponents argued the law violates their constitutional rights, but the state Supreme Court ruled in a 5-2 decision that the critics' argument is "without merit" and "unconvincing." "Collective bargaining remains a creation of legislative grace and not constitutional obligation," Justice Michael Gableman wrote in the lead opinion issued Thursday. The decision comes as Walker, a potential presidential contender, fights to keep his seat in this year's gubernatorial election against Democratic challenger Mary Burke. Two polls released in the past two weeks indicate that the two candidates are statistically tied. "Act 10 has saved Wisconsin taxpayers more than $3 billion," Walker said in a written statement. "Today's ruling is a victory for those hard-working taxpayers." As the law made its way through the legislature and to the governor's desk in 2011, Walker faced weeks of protests and swarms of demonstrators, which brought the national spotlight to Madison. 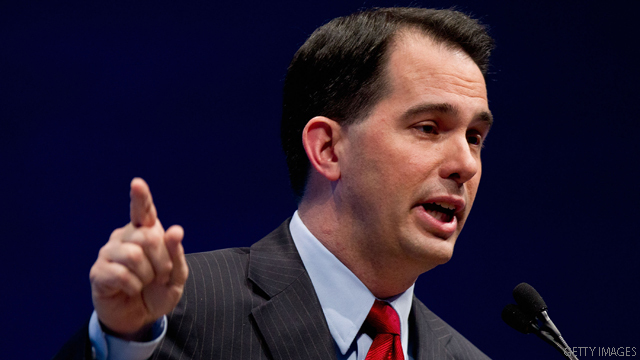 His opposition mounted a recall campaign, which Walker successfully overcame in 2012. He was the first governor to survive a recall election. In 2011, Wisconsin joined a growing number of states that passed laws requiring voters to present photo identification. In Wisconsin's case, the law says that voters can choose from one of nine forms of government-approved photo IDs. A federal judge issued an injunction blocking enforcement of the law in April, saying it violated the Voting Rights Act. A state judge had earlier tossed out the law on similar legal grounds. Critics say the law, known as Act 23, disproportionately affects minorities, many of whom don't have government forms of identification. But proponents of the law say it's meant to prevent voter fraud and impersonation. The state Supreme Court sided with the proponents, saying opponents "failed to prove Act 23 unconstitutional beyond a reasonable doubt" and that presenting a photo ID is not an "undue burden on the right to vote." In his written statement, Walker said the law "is a common sense reform that protects the integrity of our elections." The Advancement Project, a civil rights group fighting against voter ID laws, called the decision "a substantial blow against maintaining equity in our political process." "As the leading democracy in the world, our state governments should work to keep our voting system free, fair, and accessible to all Americans," said Penda D. Hair, the group's co-director. CNN Supreme Court Producer William Mears contributed to this report. This idiot is a very pathetic one. it Does not matter. Walker, the Koch lapdog, is done and he knows. That law will be repealed after the next election. -apparently not, or he would have lost in the recall election. Listen to the liberals cry, common sense should tell you that you need ID to vote. You need ID to drive, write checks, proof of age, to get passports, hundred's of places here in the USA require ID. Why should voting be any different? Maybe because the Democrats are worried that the illegals in this country can not vote. After all that is why the Democrats support illegal immigration for the votes. "Why should voting be any different?" The answer is the Constitution. Over and over the Constitution has affirmed people right to vote without ANY blockage. Why is it some state issued ID's [i.e. state university ID] are not sufficient? As an ignorant republicant I do not wish to have educated people voting. Simple as that... educated people tend to make well inormed, thought out decisions when they are voting and my party and my masters, the koch brothers, just cannot have that happen. Otherwise we would lose every election. Yes, we want our voters to be ignorant followers who just tune into faux news and hear our message... not independent educated thinkers. Are you Mad? What does reducing the early voting time period have to do with voter fraud at the polls? The less time people have to vote means the less people voting, which means good for us. Our people will be provided ample opportunity to register and vote,. It is just the poor, elderly, minorities, women, and working folks we want to hinder. So in short, the answer to this question is Nothing... this is just the reason we give to diesnfrenchise the Democrats. What does reducing the hours of operations at locations that issue free IDs have to do with fraud at the polls? Same as the above question... just another ruse to disenfrenchise the people we know will likely vote for our opponents, i.e. not rich, not ignorant, and not well informed. Why would a gun permit, a hunting license, or a fishing license be accepted, but not my voter registration card? Because well uh... hahahahahaha.... you just don't get this do you? I am using these ruses to make it look like I am fighting a problem that doesn't exist... a straw man I have created out of thin air which I can use to gin up my ignorant misinformed base. I have an entire network ran by one of my rich, foreign masters which will run a 24/7 misinformation campaign to convince the rubes this straw man exists, so I can er... uh... level the playing field, so to speak, as it is a well known fact of politics that there are many more Dems than there are republicants so something must be done to keep some of them from voting, otherwise they will win every election. So we must lie and cheat... it is our duty to our Masters and our party to do these underhanded things. The Dems.. .well, they only want to support the Constitution and America... that's just silly, how will they get rich doing that? Yeah, well... Nice try Lizzie but you haven't a clue. The recall election was as much about a referendum on the recall PROCESS in WI, as it was about Scott Walker. We'll see how well he does in November. He's to busy flying around to fundraisers and patting himself on the back for surviving the recall to have made much positive impact. His ads don't highlight any accomplishments and only demonize his opponent. @"Hours of operations", everything has a time limit. That goes for early voting as well. I actually agree with Thomas`s comment, the goverment should provide everyone with an ID. What does combining 3 voting locations into one, and putting it in a building w/35 parking spaces have to do w/voter fraud? What does making nonGOP voters travel 350 mile round trip to get and ID have to do w/voter fraud? What does no early voting on weekends have to do w/voter fraud? NOTHING! Walker's supression law is the same as the other 3 state laws I just mentioned. It is intended to make it much harder for TEA/GOP opponents to register and vote. If you can't see that, you are intentionally ignorant, or completely in favor of this anti American tactic.